Welcome to Noo Yawk Siddy!!! New York City is home to too many things to begin mentioning (TIP: See resources below). Most people think of NYC as just the borough of Manhattan, but there are phenomenal things going on in the other boroughs as well (Bronx, Brooklyn, Queens, and Staten Island). Just think, you can’t go to a Yankee (Bronx) or Mets (Queens) game without leaving Manhattan. As with many modern metropolises, you have a plethora of transportation options; walking, buses, trains, etc. . . . oh and now even convenient rental bikes (https://citibikenyc.com/). But sometimes you just want the luxury of your own personal driver who knows the city to take you where the other mass transit vehicles cannot. Then, my friend, you need a cab. One can call a cab company and order a taxi, if you have a specific time you are leaving. Or, you can use one of the SmartPhone apps like Hail-0 (https://hailocab.com/nyc) or Way2Ride (http://www.way2ride.com) (TIP: They can be found on the Apple Store or Google Play). But, if you are on the run, you are going to need to hail a cab . . . and there are some rules. First, if there is a taxi stand nearby, go and wait for a cab there. These stands are located at the airports, Penn Station, Grand Central, along the West Side Highway and other locations. There is no logical reason why some areas have stands and others do not, so look around first. (TIP: If you want more information on or locations of taxi stands, check out this article: http://www.examiner.com/article/a-guide-to-using-taxi-stands-manhattan) Around those locations it is illegal for a taxi to pick you up other than at a stand. Regarding locations, it is best not to hail a cab in the middle of a block. The only exceptions are if you have called for/ordered a cab and are waiting for it or if you have gear or baggage that you need to put into the trunk. Now to hail a cab . . . stand on the street corner and face the oncoming traffic. Raise your hand definitively in the air and look down the block for the next available taxi. If you raise your hand timidly, the driver may assume you are either not ready for a taxi or do not know where you want to go and will most likely pass you by. Try to see into the cab to see if it has any occupants (NYC taxis are not allowed to pick up multiple fares.). Another item to take note of is the identifying light on top of the cab. There are three states it can be in (See image). If the taxi’s identifying numbers are lit up alone, it is available for hire. If all the lights are off on it, it is occupied or on its way to pick up a fare. 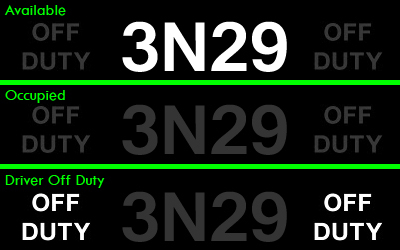 If the “Off Duty” lights are lit, the driver is at the end of his/her shift and heading back to the garage. (Tip: You can attempt to hail an “Off Duty” cab. If you are heading in the same direction of the garage, they may stop to pick you up or stop to ask where you are heading. If it’s convenient for them, they just may take you.) If the taxi appears to be available, make eye contact with the driver to show your intent on needing a cab. Watch to see if he/she shakes their head negatively. This could be due to them being off duty and heading back to the garage or heading to a prearranged fare. While attempting to hail a cab, make sure to be aware that no one else is hailing one as well as it is rude behavior to cut in and take a taxi someone else is waiting for. If there is another person ahead of you, you can ask them if they want to share the cab with you. Surprisingly this works on occasion. There are some rules that NYC taxi drivers must adhere to. If their “available light” is lit, they are not allowed to refuse a fare. All NYC cabs are equipped with credit card machines and they must accept either credit card or cash. For a full list of NYC taxi rules, please visit: http://www.nyc.gov/html/tlc/html/rules/rules.shtml. Once you reach your destination, make sure to check the meter (as you should also do along the way), located on the front dashboard, to see what the fare is. Unless the driver got into an accident or drove in a life threatening manner, you should ALWAYS give a tip (15 – 25%). While the fare may seem expensive, these drivers have a lot of overhead to pay for (i.e., rental of the taxi, gas, maintenance, etc. ), most of which never reaches their pockets. So, a tip is where they make most of their take home pay. (TIP: Tips should be based on a percentage of the actual fare NOT a flat amount that you think is reasonable.) NYC taxis have the ability to accept credit cards so you can pay either cash or credit. Once done, leave the taxi promptly, on the sidewalk side of the vehicle, to allow them to pick up their next fare. 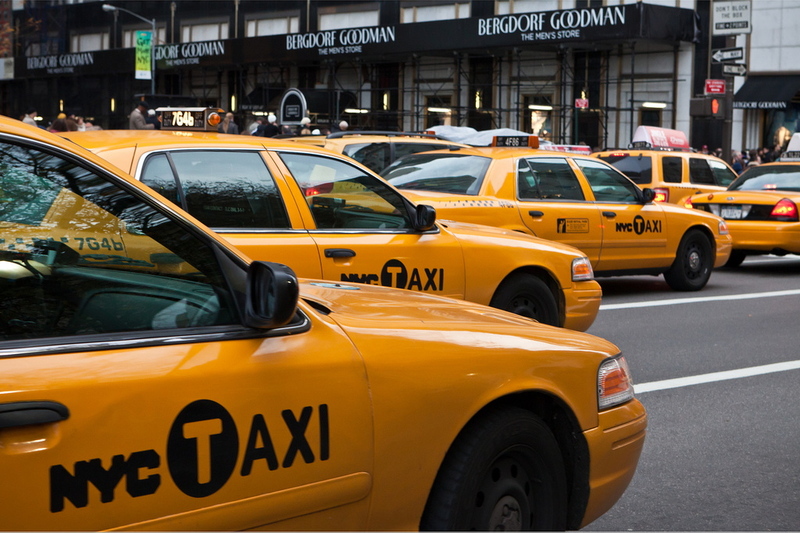 Now that you know how to hail a NYC taxi cab, get out there and explore all that the five boroughs have to offer!